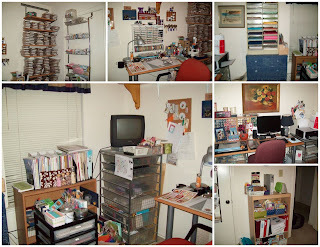 I am using my second bedroom as my craft room. A while ago, after cleaning it (as well as could be expected for a lot of stuff), I took some pictures of it to send to my Uncle Garner who lives in Dallas so he could see my "creative" space. In return he made this collage (is that how you spell it?). I thought it was TERRIFIC and speaks so well for his computer savvy!! So, I'm sharing it and his talents with you!! I'm in the middle of making a bunch of Halloween cards to take to my doctor's office for he and his staff to pick from for their families and friends. I'm also doing my usual duties - cleaning, dishes, laundry - that I do every week-end. 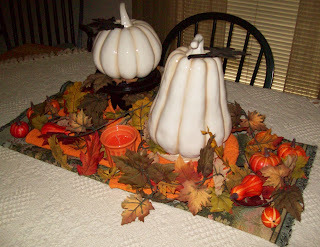 During the cleaning chores, I got down my fall decorations -- a swag of fall leaves for the front door and the table decorations for the dining room. The door swag I ordered online a really long time ago and pack it away every year. 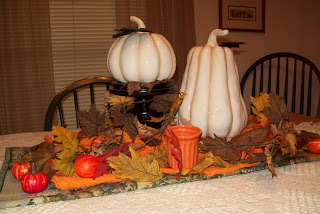 The table is made up of two gorgeous ceramic pumpkins and a black candle stand that my daughter, Susan, gave me for my birthday last year. All of the other things (fall leaves - actually 3 vines of them - pumpkins, goards, etc.) I purchased last year at the Dollar Store (and, yes, they were ACTUALLY a dollar). This is my favorite time of the year -- the colors, foliage, and everything! We're having our first chill of the season. It's in the high 50's low 60"s outside and the leaves on my trees are falling in the yard. GREAT!!!!! Sooooooooo nice! I think it looks wonderful and will enjoy it for the next weeks before putting out the Christmas decorations. Thank you for stopping my and I'll see you guys later.